Looking back from the start of the new millennium it can almost be said that St. Mary's College has two histories ~ that from the time of its foundation in 1850 at Brook Green in Hammersmith where it stayed until 1925 and then, from 1925, in the more spacious and elegant surroundings of Strawberry Hill. In origin, St. Mary's was a College whose sole and specific aim was the training of Catholic men to serve as teachers in Catholic schools throughout the country. The very first group of students was five strong and this gradually increased to intakes of 50 or so young men a year. Today there are about two and a half thousand students, men and women, reading a variety of subjects at undergraduate and postgraduate levels. In so many ways the life of the Simmarian of 1850 was unrecognisably different from that of the young undergraduate of 2003. What sort of England did the young men of 1850 live and work in? Queen Victoria was just thirteen years into her long reign and, in 1850, the Prime Minister was Lord John Russell. Only those who could prove a property qualification were allowed to vote in parliamentary elections. Indeed there was no universal suffrage for another seventy years and women were denied the same right until ten more had elapsed. Slavery had been abolished barely fifteen years before the founding of College and England was involved in the Crimean War and the Indian Mutiny soon after. The wars and overseas trade encouraged the development of the industrial towns where the wretched standard of living was revealed in the first government Blue Books, including the riveting and horrifying volumes of Edwin Chadwick on the Sanitary Conditions of Large Towns. In the factories there was the widespread abuse of child labour and the existence of schools for the poor children was a matter of great rarity. Each year, for generations, it had been customary for Irish farm workers to come to England for the harvest. Most returned to their families and homes in Ireland but some few stayed each year, often migrating to the towns and the new factories. In the late forties the influx from Ireland became a flood as widespread famine prevailed at home. Entering through the ports of Liverpool and Glasgow, these refugees spread southwards to the towns of Lancashire and the Midlands, swelling the slums and shanties that had grown up around the factories. 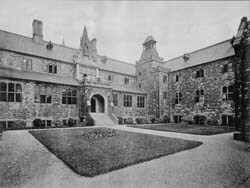 The Catholic Church in England had still not properly shrugged off an almost secret observance brought about by its recusant past but, remarkably, there were many who saw the urgent need for the provision of elementary education for the poor, especially for the newly arrived Irish few of whom could speak English, let alone read or write. The man most to be credited with this work was Cardinal Wiseman whose inspiration it was to form the Catholic Poor School Committee in 1847. Some funds for education were beginning to come from government and by the middle of the century there were already some hundreds of British and National Schools and others founded by the British and Foreign School Society which was run on Lancasterian principles. These bodies were considered sufficiently responsible to administer government grants. The Catholics had no such body and any schools built were provided from collections and gifts. One role of the CPSC was to become the recognised Catholic body that would administer government grants and the other was to found a College for the training of men teachers for the Catholic poor schools. To house this new College, a property was bought in Brook Green, Hammersmith by the CPSC. It already had a long Catholic association. From the mid-eighteenth century it had been a school for girls supported by Bishop Challoner but even earlier it had been used by Mary of Modena, the wife of James II and perhaps because of this and other associations the area was known as Pope's Corner. The building was there, some funds were becoming available but what about recruits? It was considered, at first, that because of the poor conditions in which they would have to work and the inadequacy of the salary it would be possible to pay, that the only young men who would come forward would be driven by vocation. The first intention, therefore, was to create a teaching brotherhood and negotiations were opened by Wiseman with the Abbe John-Marie Lammenais who had started a teaching order of brothers in Brittany. Five young men arrived in Ploermel on Christmas Eve 1848 to start their training as teaching brothers while Brook Green was converted to a training college dedicated to St. Mary. The first Principal of the College was Father Glenie, a convert from the Oxford Movement. 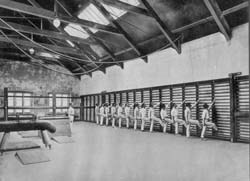 Within two or three years the links with Brittany disappeared and the whole training of the recruits coming forward was carried out at Hammersmith. Soon after its foundation the College could boast of 50 - 60 students in residence each year. They came now as laymen and when qualified taught in the growing number of Catholic elementary schools. 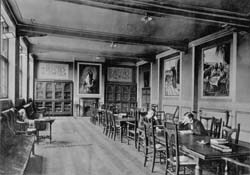 Wiseman and the CPSC, with the men who were trained in these early days at Brook Green, can be said to have been the founders of the Catholic education system which is so sought after today that its schools at primary and secondary levels are largely oversubscribed. This clearly comes about, not just for the efficient teaching of curriculum subjects, but from the spiritual and moral standards which are at the core of these successful schools. In 1850 there were fifty students, in 1950 there were two hundred and eighty. Now into the new millennium, the number has risen to two thousand five hundred. The professional training of Catholic teachers is still at the heart of the work of the College but now undergraduates will include many studying for a variety of BA and BSc degrees, there is an ever increasing number of postgraduate MA and Diploma courses and now the College supervises and presents its own PhD students. This constant expansion and the greater sophistication of courses has required a succession of building programmes.